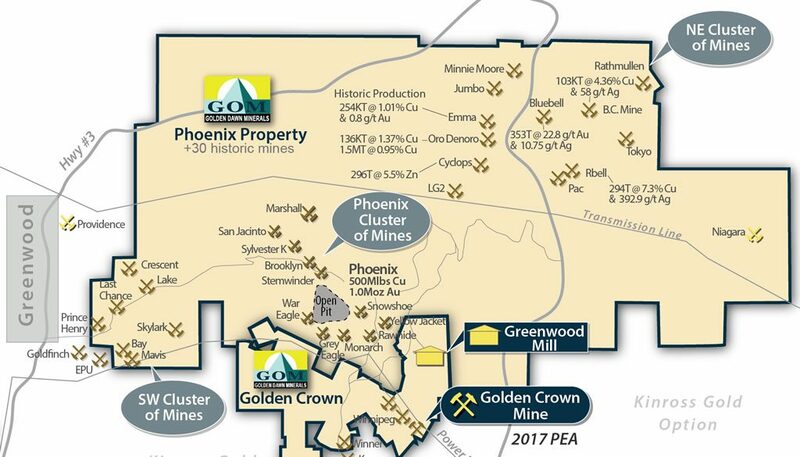 In January 2017 Golden Dawn acquired the shares of Kettle River Resources Ltd. (KRR).The KRR assets include the Greenwood Area Properties (GAP), with mineral claims totaling 11,000 ha., covering 78 mineral showings, including over 30 historic metal mines including the large Phoenix mine which produced over 500 million pounds of copper and one million ounces of gold up to 1978. Also included is an extensive database representing 120 years of geological and mining information, comprised of files, records, reports and maps, rock specimen samples, and a core storage library. 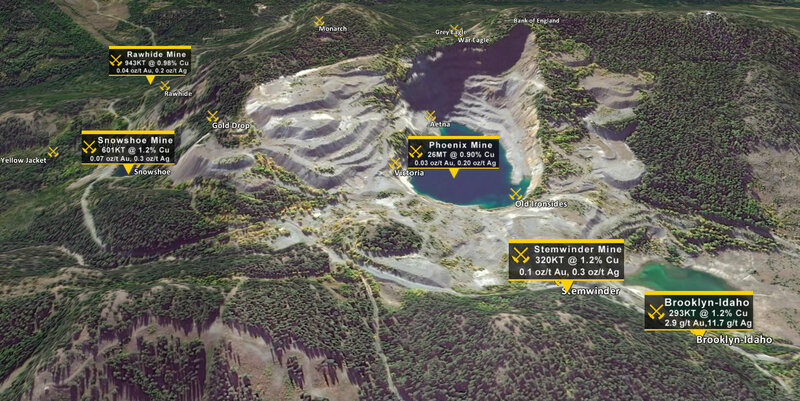 All showings and historic mines are within a 15 km radius from the company’s Greenwood mill. 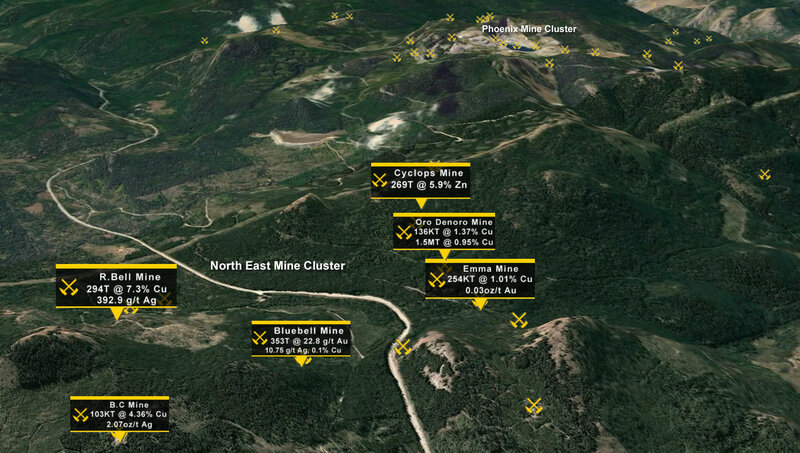 These historic copper-gold deposits are clustered in three areas: North East, Phoenix and South West Mine Clusters. This localized grouping of occurrences suggests the three areas may overlie porphyry-copper gold source intrusions, and were generated by metal-rich hydrothermal fluids that ascended from the intrusions. 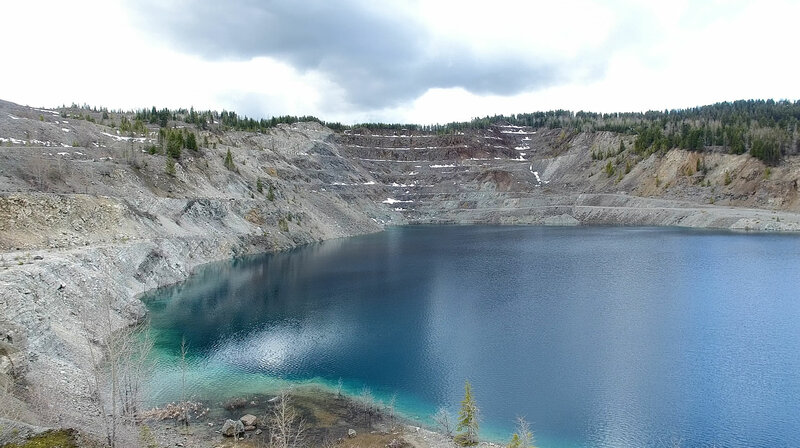 The majority of mineralization in the Greenwood Camp can be classified as copper-gold skarns or skarn — related. Early pre-1919 exploration in the Greenwood camp focussed on such massive sulphide/oxide ores that were self-fluxing and could be shipped directly to smelters. Lower grade footwall stringer mineralization was largely ignored, as the mines wished only to ship high grade ore. As such there is excellent potential to discover large tonnage deposits of low to moderate grade copper-gold skarn material peripheral to the historic mines. In addition, since most of the historic mines were focussed on copper, the iron-rich skarn zones of mineralization were largely ignored. It will be important to re-evaluate all of the skarn deposits for gold. The Company is planning to fly VTEM deep penetration geophysical airborne over the properties. VTEM is a relatively new technology with the capabilities of detecting possible structures controlling mineralization at significant depths. 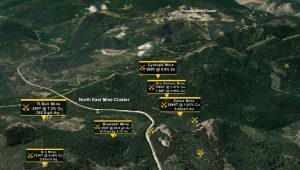 It is hoped that the survey will provide further clues as to the source of the mineralization for the some 30 past producing mines on the property. The past-producing Phoenix copper-gold skarn deposit (mined from 1900-1919 and 1956-1978) is the main area of mineralization on the property. In the early years, Granby operated the Phoenix mine as primarily an underground operation, although in addition to the underground work, there were 3 steam shovels and a large electric shovel mining from surface in the Glory Hole. Most of the ore was produced from the Old Ironsides, Victoria and Knob Hill claims, and was direct smelting ore shipped to the company’s smelter in Grand Forks for processing. Declining copper prices following the end of World War I, lower ore grades and a shortage of coal for the smelter resulted in mine closure. In 1956, Granby re-evaluated the Phoenix mine for its open-pit potential. In addition to the claims it had historically controlled, Granby acquired several nearby properties, including the Snowshoe, Brooklyn-Idaho and Stemwinder properties. All are now part of Kettle River’s land holdings. Construction of an on-site flotation mill was started in 1956 and processing of ore from the open pit began in 1959. Mining operations at Phoenix were terminated in 1976. The mill continued to operate until 1978, but was later dismantled and moved from the site. Historical production records indicate that total production by Granby from Phoenix (including production from the Snowshoe, Brooklyn-Idaho and Stemwinder in the second phase of production) was 25.5 million tonnes at an average grade of 0.9% Cu and 1.1 g/t Au. An additional 1.7 million tonnes was produced in the immediate area by others, at the Rawhide, Snowshoe and Brooklyn Mines, so the total historical production from the Phoenix area is just over 27 million tonnes. The historic mines within the NE cluster which in early years provided the major production are all found to be located along or within a short distance of the contact of limestone and overlying greenstones and volcanics. Fracturing in both N.E. and N.W. patterns has undoubtedly aided mineralizing solutions and is responsible for many of the heavier concentrations of suplhide minerals.